I just came across this footage of the 50th Anniversary Parade I was in at Buckingham Palace, On this video you can just catch a glimpse of me in an American 8th Air force uniform standing by the jeep with my Buddy. About 1:58. At about 10:08 you can see me in the Jeep on the left, its old footage and not that clear but you can see the Jeep easily, my MUM, and My Aunt saw this on the National News and I was easy to spot waiving at the Queen and Lady Diana. Such a fantastic experience and to get so close to all the Royal Family too, I used to deliver to Princess Margaret when I was a dispatch Rider, but to see the Queen, Prince Phillip, Prince Charles, Lady Diana, Prince William and Prince Harry was a really rare sight and with 250,000 people screaming with joy was breath taking to say the least. 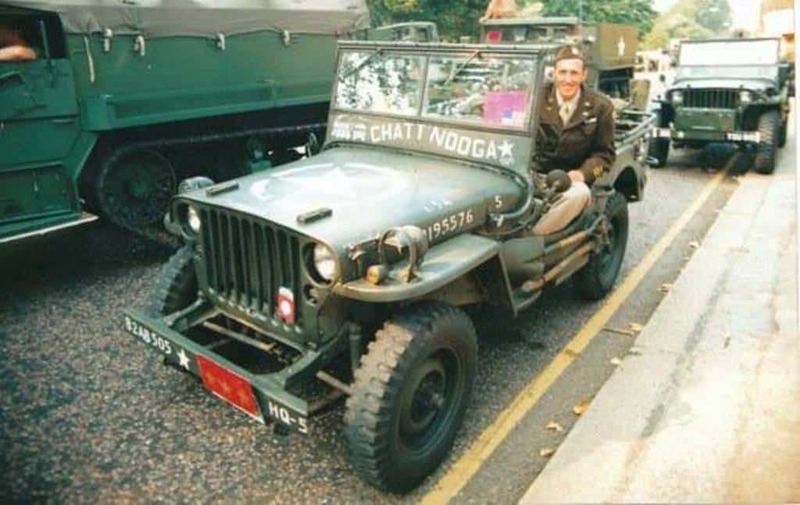 There were 50 of use Jeeps to represent every year since the end of WW2 and were located right in the middle with Chattanooga emblazoned across the front of the Original Normandy Landing Willy’s Jeep. Such a brilliant feeling having a WW1 Veteran in the back of our Jeep taking the salute to Queen Elizabeth the 2nd. I was wearing a Captains Uniform but we made a general 3 Star plate up to get in the middle of the group, and boy what a day. Just thought I would share, I mean, I doubt I will get my Knighthood, so that may be the last chance I get to meet Her Royal Highness. This entry was posted in Blog and tagged 1995, Buckingham palace, Eighth Airforce, end of ww2, HRH Queen Elizabeth, Meet the Queen, Price Harry, Price William, Prince Charles, Princess Diana, Princess Margaret, VE Day, Vera Lynn, VJ Day, Willys Jeep.